This weekend the clocks go forward in both the United Kingdom and the Republic of Ireland - but imagine waking up in Belfast to discover you were in a different time zone from Dublin. It might sound ridiculous, but for a few years in the middle of the 20th century that was exactly what happened. Even more surprisingly, from 1880 to 1916 someone travelling on the Holyhead to Dublin ferry would have to move their watch back by 25 minutes when they arrived in Ireland. The reason? Ireland had its own time zone - known as Dublin Mean Time - which was 25 minutes and 21 seconds behind Greenwich Mean Time (GMT), the local time in the rest of the United Kingdom. 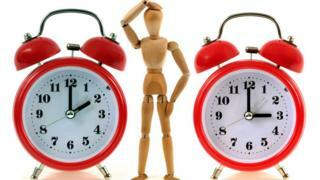 BBC iWonder - Is changing the clocks a waste of time? Earlier in March, the European Parliament backed proposals that would see member states stop the process of changing clocks twice yearly, raising the prospect that Ireland and Northern Ireland could end up in different time zones for the first time since 1947. So is it likely to happen, and what might happen if it did? Until the 19th century the time varied from place to place, so clocks in Omagh could have displayed a different time from clocks in Belfast, and so on. This became problematic as railways and telecommunications developed. Train timetables would be confusing if each destination was in a different time zone, while communicating by telegraph was more straightforward if the receiver was on the same time zone as the sender. To solve this problem, standardised time zones covering much larger areas were created including, in 1880, Dublin Mean Time. This was the local mean time at Dunsink Observatory outside Dublin, which was about 25 minutes and 21 seconds behind GMT. In 1916 Ireland switched to GMT to fall into line with the rest of the UK. David Malone, senior lecturer at Maynooth University, says it was partly prompted by a lobby group which wanted a change for business reasons. It also followed the British government introducing daylight savings time in the summer in order to save energy and help the war effort. The government decided it would make more sense to move the whole UK to the same time zone to coincide with this change. Dublin Mean Time may have been officially abolished, but not everyone moved with the times, according Peter Leary, vice-chancellor's research fellow in history at Oxford Brookes University. He discovered testimony from a Donegal farmer called Alexander Bryce, speaking to the Irish Boundary Commission which was set up after Ireland was partitioned in 1921. "He kept his working day to what it would have been under Dublin Mean Time. "This became an issue when the border was created, because of customs posts. He had to deal with bureaucracy on a daily basis. "The customs posts closed at 17:00 [Northern Ireland time] so he had to go about things much earlier in the day." This was exacerbated because of the introduction of daylight savings time in the UK, so in the summer farmer Bryce would have been an hour and 25 minutes behind rather than just 25 minutes. If he wanted to bring goods back from Derry to Donegal he would have to make sure he would make it to the customs post by 15:35 (according to the time he kept). There were also two different time zones within the island of Ireland from 1941-47 (with the exception of 1946). To save energy during World War Two the UK adopted double summer time, but the Irish Free State did not follow suit, meaning it was an hour behind Northern Ireland all year round. So did this cause a headache for those living along the frontier? "It does not seem to have caused people an enormous hassle," Mr Malone says. "But there were jokes in the papers about people leaving Newry and arriving in Dundalk before they had left. "Railways had to re-issue their timetables, as did the Dublin-Holyhead ferry. "It would cause a bigger problem nowadays." Following the European Parliament vote Taoiseach (Irish Prime Minister) Leo Varadkar said he would not allow a situation where Northern Ireland was in a different time zone to the Republic of Ireland. Mr Malone believes the almost constant alignment of Irish and British clocks since 1916 is largely down to convenience. "I think everybody has just accept it is the sensible thing to do," he says. "It would be a really strange thing [if Ireland and the UK were in different time zones] but it is clearly manageable if it was decided to do it. "It would not be impossible, but it would seem strange."